Discovery Notes Backyard at 64 Wentworth in Bridgeport CT. loose, dark soil with pieces of twigs near garden. Air temperature approx 82 F. Depth 13 cm. Soil sample collected by Letrice Samuels. 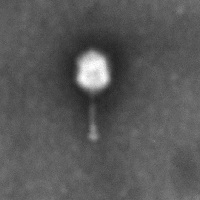 Phage discovered and isolated by Letrice Samuels and James Hoffman. Naming Notes Names using the first initial of Letrice Samuels' and James Hoffman's last names.